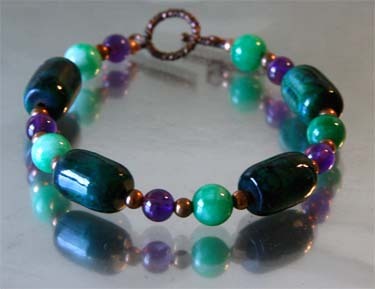 Beautiful to look at, the Feel Good Arthritis Bracelet can help relieve the symptoms of arthritis. 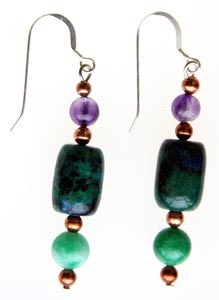 Chrysocolla, with associations of tranquility, peace, intuition, patience and unconditional love, is known as a healing stone among Native American cultures where it has been used to strengthen the body's resistance to illness and emotional duress. It has also been used traditionally to bring about calm feelings where there is upset and can be used to purify and restore balance to a person. Its powers are enhanced by using it with copper. Jade reduces tension, alleviates sore back or spine and increases longevity. The presence of amethyst is an added bonus since it is well-known as the all healer stone. The bracelet comes with a descriptive card. I love the Southwest Colorsa used in this bracelet. A strikingly beautiful necklace, it has healing powers to help alleviate the pain and discomfort of arthritis and inflammation.